The Amazon Fire is a great inexpensive tablet for kids and teens, but does it work with programmable robot toys such as Sphero, Ollie, Parrot Drone, Dash & Dot, Meccanoid, LEGO Mindstorms, mBot and OzoBot? Note that unless a robot is officially supported we can only report on our experience. You may get different results with different OS versions, app updates, firmware versions etc. Hopefully support will get better in future too. We've covered sideloading as well as official support because you can do so much more if you take this approach. It's not recommended though and what we'd really like is to see more support for the Amazon Fire. It provides a fairly inexpensive but well-supported tablet option for families. 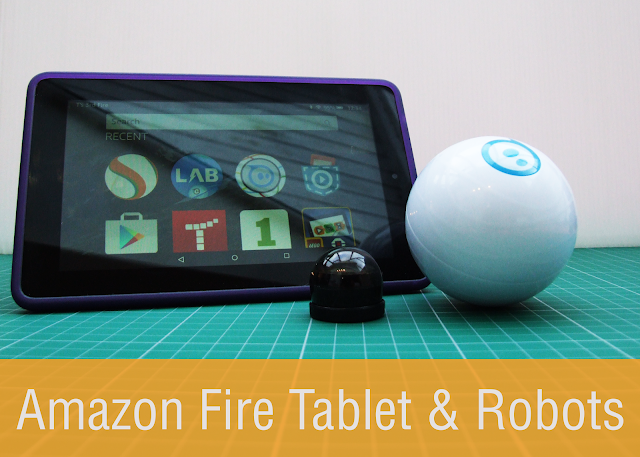 First we'll take a look at the robots that can be controlled and programmed from the Amazon Fire Basic tablet without side-loading. That means that the apps you need are either available from the Amazon App Store or you don't need an app and the website works. Side-loading means installing apps that aren't in the Amazon App Store. It's not recommended as apps aren't regulated in the same way and updates and other features may not be offered in the same way. Sphero is one of our top choices of programmable robot for Amazon Fire. The official Sphero app is in the Amazon App Store. 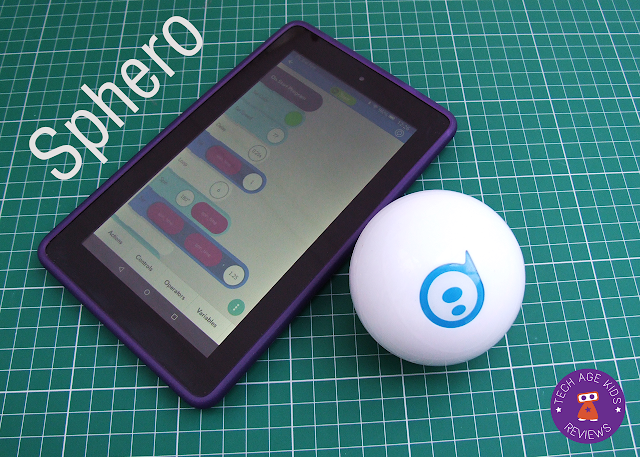 This is the main controller and fun app for Sphero and has lots of missions to complete. Even better in our opinion, the Sphero SPRK Lightning Lab coding environment for Sphero is in the Amazon App Store. This means you can program Sphero using drag and drop coding. 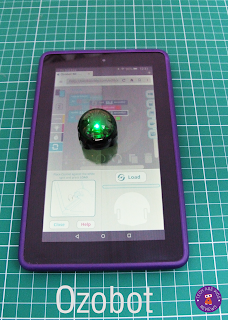 We really appreciate being able to control Sphero from an inexpensive Amazon Fire tablet. Especially when the kids want to take it outside. Unfortunately there's no sign of the Ollie app on the Amazon app store. This is a shame, especially as Orbotix, makers of Sphero and Ollie, is an Amazon launchpad company. But the SPRK Lightning Lab also work with Ollie and we've been able to program Ollie from the Amazon Fire Basic with no problems. This means that the Amazon Fire is great for coding Ollie but you can't do tricks without sideloading. Unfortunately the OzoBot app isn't in the Amazon App Store. However OzoBlockly is a browser based app and it works! This means that you can program an OzoBot from an Amazon Fire just by loading up the browser. OzoBot is programmed by placing the robot on the tablet screen which will display a sequence of flashing colours. Very neat. We found that due to the screen size we could only program one OzoBot at a time, but we'll take that! Not programmable (yet, we'd like to think :-) but a cool bit of kid tech and worthy of a mention here, the WowWee R.E.V app is in the Amazon App Store and works really well on the Amazon Fire. The WowWee MiP and MiPosaur apps are also on the Amazon App Store if you want cool robots to control. We really wish that more apps for controlling and programming robots were in the Amazon App Store. Hopefully more will get added. But for now, other apps will need to be sideloaded via a third party app such as 1Mobile Market. This isn't recommended and you'll need to relax security setting on your device to allow it. Don't do this unless you understand what you are doing and the implications. Some apps rely on service from Google Play and won't run unless you have it installed. It is technically possible to install Google Play and its services on an Amazon Fire without rooting it. We were able to successfully sideload the Sphero Draw & Drive app and control both Sphero and Ollie. We side-loaded the Ollie app and it works brilliantly. We didn't get the OzoBot apps working either by sideloading or through Google Play. The side-loaded Dash & Dot apps from Wonder Workshop work really well on the Amazon Fire. We've tried Go, Blockly, Wonder League and Path. The apps run well and the robots connect easily via the bluetooth. It's a good size for younger kids to hold when they walk around and play with the robots. The screen is slightly small for the path app, but you can easily scroll around. Update: Yay! 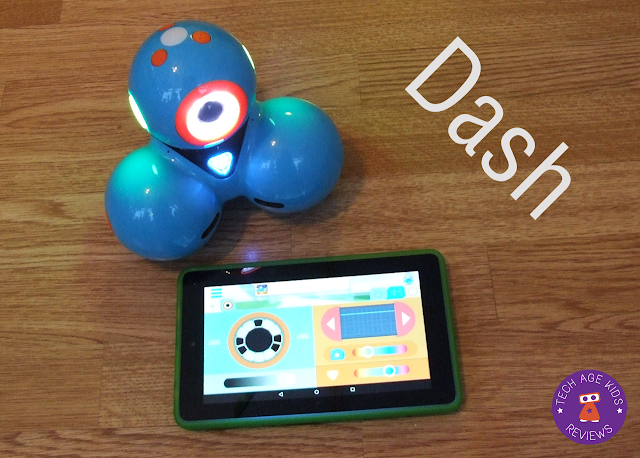 Most of the apps for Dash & Dot are now in the Amazon App Store, no need to side load! You need the FreeFlight 3.0 app to control the Parrot Spider. We were unable to get this app working on the Amazon Fire. But, we could control the Parrot Spider with Tynker on the Amazon Fire (see below.) Yay! We prefer this anyway. LEGO Mindstorms Commander is the bluetooth controller app for this popular robot. It seemed to get stuck with a 'Downloading' messsage the first time I ran it after sideloading. But I quit and reloaded and success! The LEGO Mindstorms Programmer app depends on Google Play so you need to install that on the Fire (which is possible if non-trivial) to get that working. The basic mBot control app works on the Amazon Fire when side-loaded. The more powerful mBlockly app isn't yet available for Android. It's also worth mentioning the Tynker kids coding app as this supports Sphero, Ollie and the Parrot Spider. Unfortunately Tynker failed to run on the Amazon Fire when sideloaded. Tynker does however run if you install Google Play on the Fire. We wish the tablet vendors and app stores would all play nicely together so that our robots can too! If you're looking for robots that work without side-loading (and that's definitely to be preferred) then Sphero is the best option, followed by OzoBot with OzoBlockly. Ollie is also a good choice for coding. Update: The Dash & Dot apps are available for Amazon Fire so Dash & Dot have joined our top recommendations list. If you're a techie family and willing to sideload then you have lots more options. (See our guide to buying a programmable robot for help choosing.) But we wish they were in the Amazon App Store. It's a shame that we can't run apps that actually run well on the Fire in a straightforward supported manner. We've found that the Amazon Fire is a great size for programmable robots - it's bigger than a phone, which kids find too small, but not so big that it's awkward to carry around. It's also fairly inexpensive so we're more willing to let the kids take it out in the garden to control Sphero for example. The option of using a cheaper tablet with robots is appealing, as often the robots are already a fair amount of money, and if you don't have a compatible device it really hampers your enjoyment of them. Elbrie had this experience with Dash & Dot, as her iPad was too old to work with the robots, she tried to use her Andriod mobile device. This becomes tricky when kids want to play and mummy needs to make a call. We like the idea of having a tablet dedicated to be used with the robots (whichever you choose).